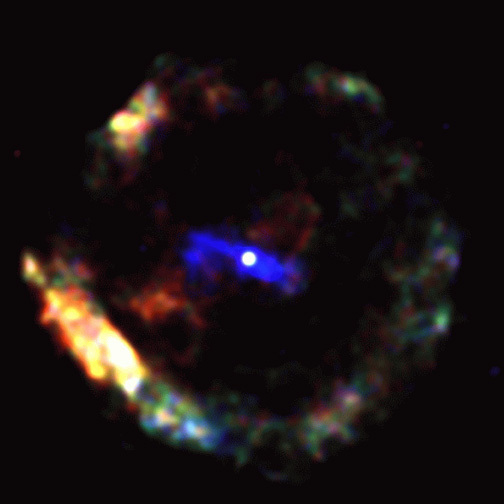 G11.2-0.3: A supernova remnant with a central pulsar, located in the constellation of Sagittarius. Caption: Using the Chandra X-ray Observatory, scientists have pinpointed the exact location of the pulsar within the supernova remnant G11.2-0.3. This provides new evidence that this pulsar and the surrounding remnant are the byproducts of a massive star that exploded in 386 AD that was witnessed by Chinese astronomers. If confirmed, this will be only the second pulsar to be clearly associated with a historic event. This result may have important implications for the births of pulsars, and, therefore, for the population as a whole. Scale: Image is 5.8 x 5.4 arcmin on a side.